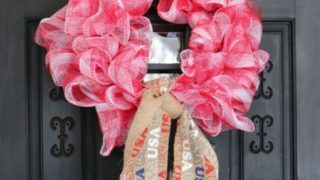 This simple to make, rustic style American patriotic mesh farmhouse wreath is wonderful for outdoor or indoor display. 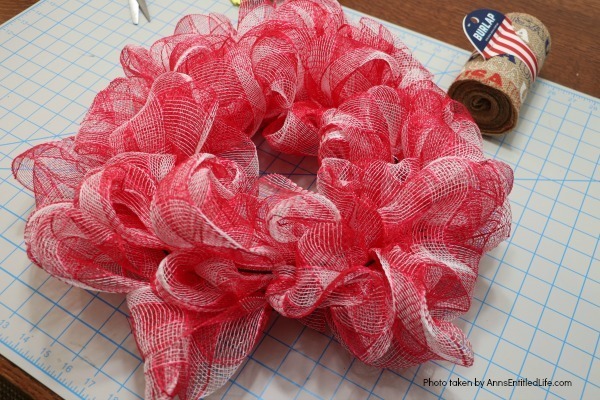 Using only three materials and scissors, this easy to make wreath comes together in about 15 minutes. If you are looking for a patriotic holiday wreath, this little beauty is it! This is truly a simple craft. It is finished quickly, fluffs easily, and boom! done. Using only three materials plus scissors making your own wreath doesn’t get any simpler than this. You can use it for summer door décor, above a mantel, as part of a Memorial Day display, Independence Day décor (4th of July décor) or a Veteran’s Day display. The rustic look is wonderful for the current farmhouse decor craze, too! 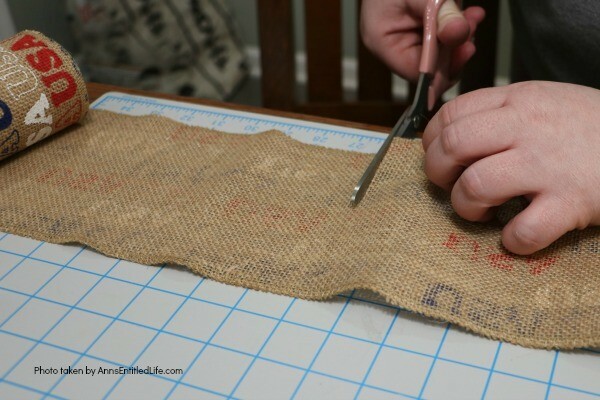 Like so many crafts this is simply an idea for you to begin with and expand upon to make your own. You can follow my steps exactly, or go off in your own direction. • A red and white mesh was used. You can use red and white, blue and white, or red, white and blue. • While we just tied a ribbon to the bottom (burlap in keeping with the rustic-farmhouse theme), you could easily make a bow if you like. Just remember to leave space for it. • The entire 10′ of mesh is used on a 12″ wreath frame with enough room at the bottom to add a simple tie. 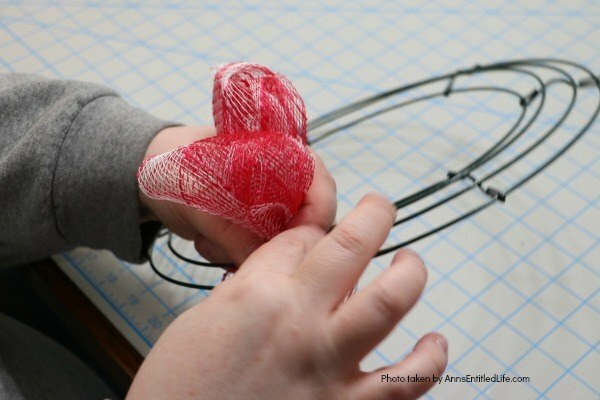 If you want to add a bow, you will need to scrunch the mesh a little bit closer together. • 50″ of ribbon was used to make the tail tie. 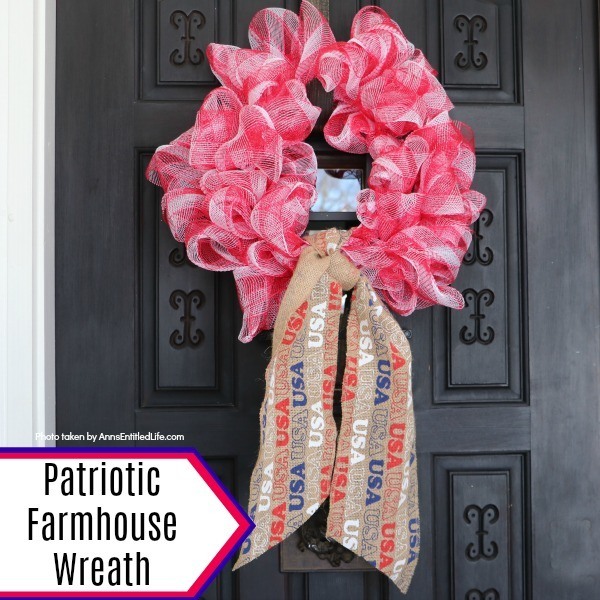 • Nearly all the materials necessary to make this easy Patriotic Farmhouse Wreath craft can be purchased at at JoAnn, Michaels, or Hobby Lobby. 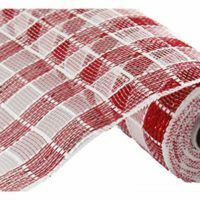 • Unroll the checked red and white mesh, and fold the mesh in a small loop. 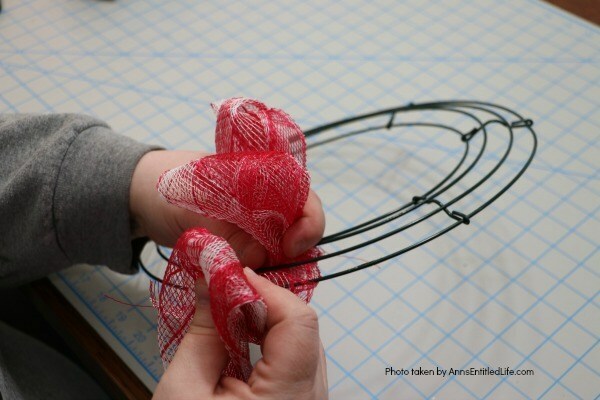 • Pull that first loop the the free gap in the wreath frame (furthest from you); hold the loop in place. 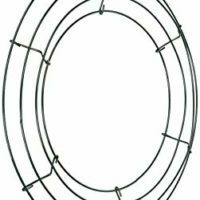 • Form a second loop with the mesh, and pull through the second gap of the wreath frame; pinch and hold both pulled through loops in place. • Make a third loop, through the final wire gap. • The volume of the mesh will hold it in place, there is no need to tie off anything. • Fluff the loops as you go. • Repeat until the wreath is complete. 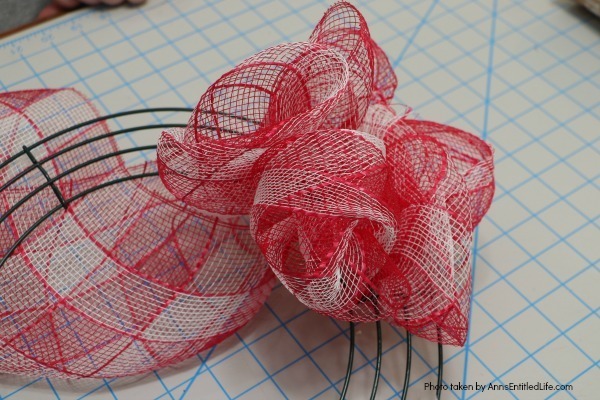 • The 10 feet of mesh will fill the wreath and allow you a small space at the bottom to tie off a tail or a bow. 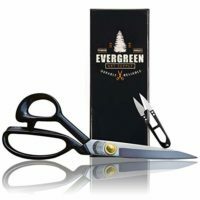 • The tail shown is 50″ long (measure and cut), and just tied with a square knot (left over right and under, right over left and under). 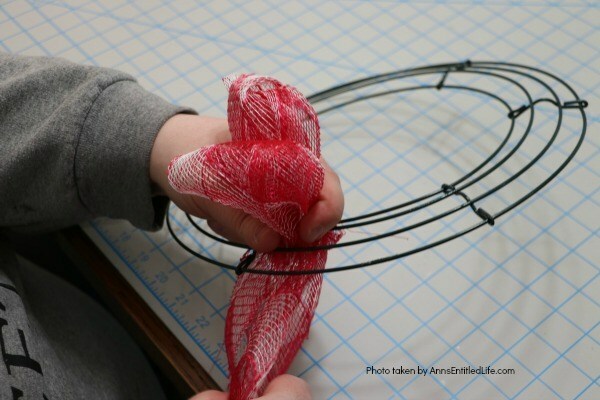 • Trim the bottom of the of the tail either on a slant, or as a V.
The entire 10' of mesh is used on a 12" wreath frame with enough room at the bottom to add a simple tie. 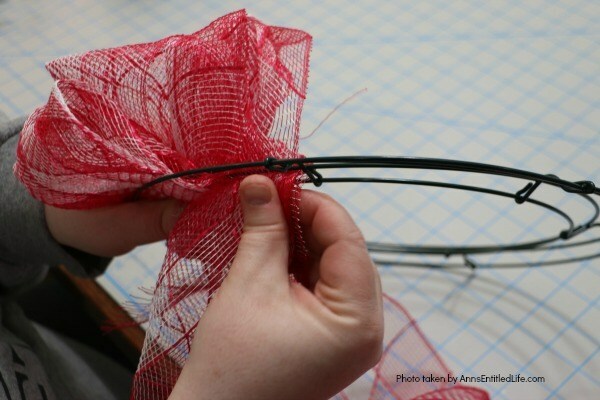 If you want to add a bow, you will need to scrunch the mesh a little bit closer together. 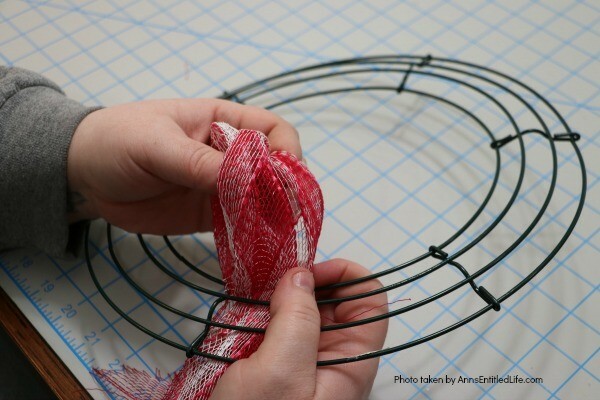 Unroll the checked red and white mesh, and fold the mesh in a small loop. Pull that first loop the the free gap in the wreath frame (furthest from you); hold loop in place. Form a second loop with the mesh, and pull through the second gap of the wreath frame; pinch and hold both pulled through loops in place. Make a third loop, thread through the final wire gap. The volume of the mesh will hold it in place, there is no need to tie off anything. Fluff the loops as you go. Repeat until the wreath is complete. 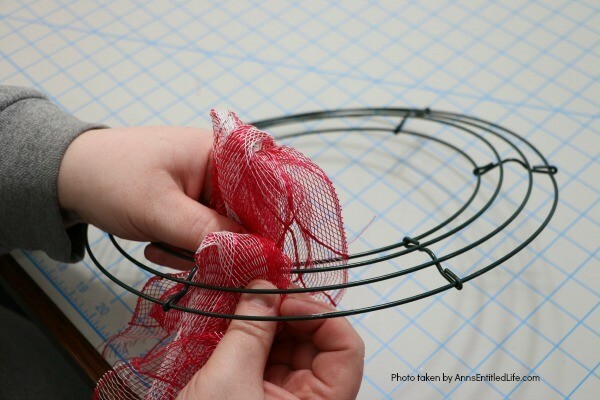 The 10 feet of mesh will fill the wreath and allow you a small space at the bottom to tie off a tail or a bow. The tail shown is 50" long (measure and cut), and just tied with a square knot (left over right and under, right over left and under). 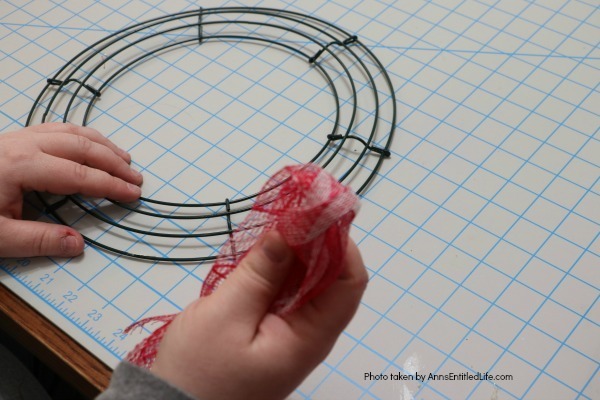 Trim the bottom of the of the tail either on a slant, or as a V.
• Easy DIY Flag Wreath – Make your own no sew Flag Wreath using these easy step by step instructions. 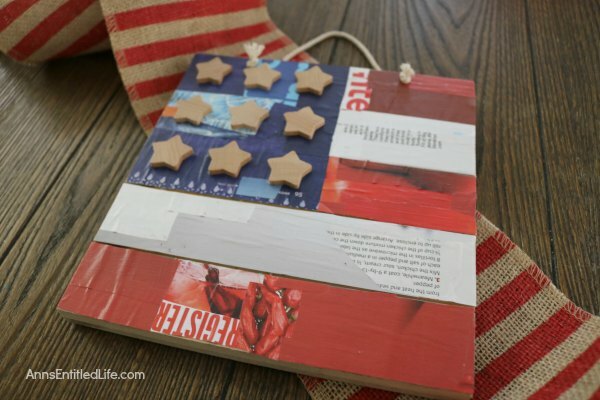 This cute patriotic decor is perfect for Memorial Day, Independence Day, or any day! Simple and inexpensive to make, this Easy DIY Flag Wreath will add a marvelous touch of whimsy to you holiday decor. 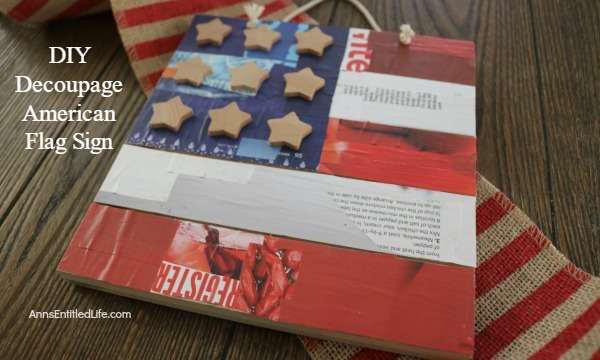 • Wooden American Flag DIY Craft – This rustic American flag craft project is simple to make. 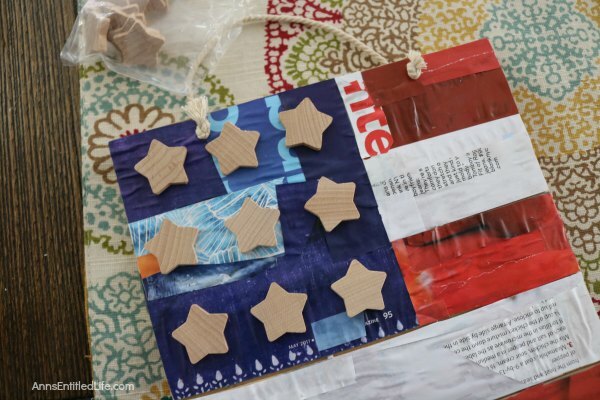 Large enough for outdoor use, this rustic American flag craft can also be used inside the house. • Flag Wineglass DIY – Make your own unique patriotic flag wineglasses! This easy step by step tutorial will show you how to easily make “American flag” wineglass decor which are perfect for a centerpiece, mantel decor or table decorations. 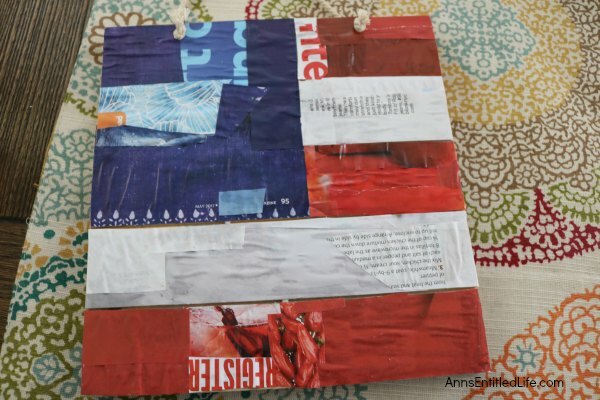 This rustic American flag craft project is simple to make. 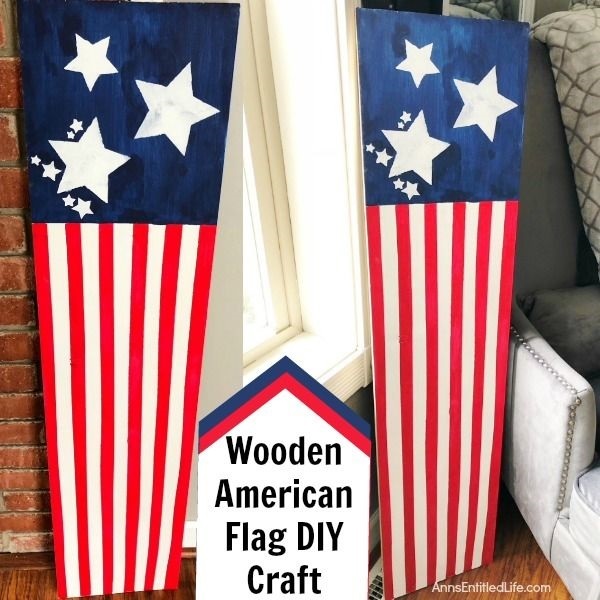 Large enough for outdoor use, this rustic American flag craft can also be used inside the house. 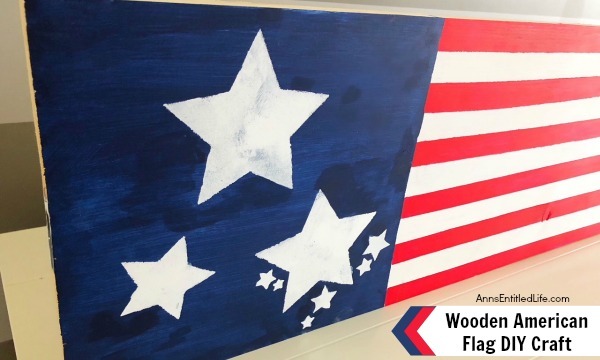 These easy step by step instructions in this short tutorial will show you how to make this wooden American flag craft is no time flat! • If you plan on hanging this flag be sure to attach the hooks to the back before you start the project. That way you will not nick-up the front after painting when you flip it over. • To make the paint lines – use a yardstick and pencil to draw straight lines so you know exactly where to place your tape, or use a chalk line and snap it (which is easier). Make certain the marks are covered with paint. • Use painter’s tape if you can instead of masking tape. 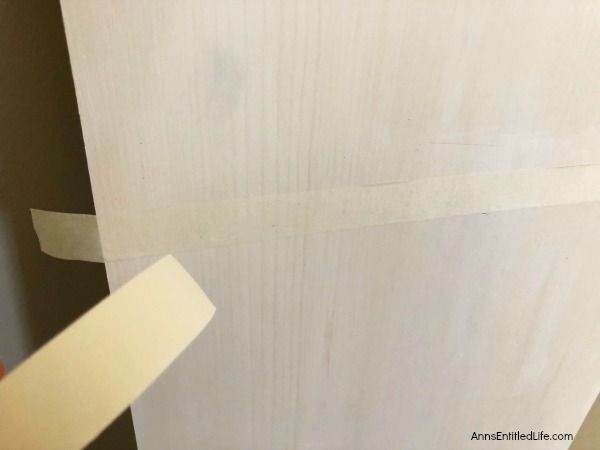 The painter’s tape should prevent leaking, and lift off without taking paint along with it. 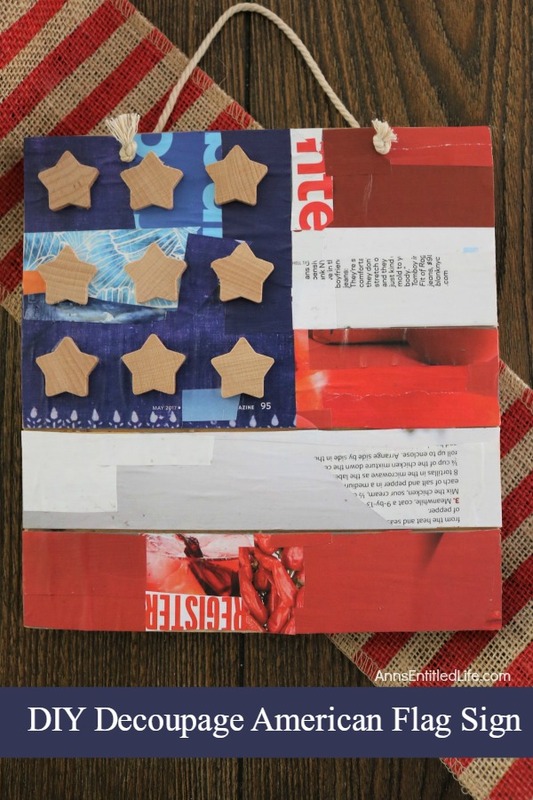 • This is a rustic American flag craft. Seeing the wood underneath is not a bad thing. If you do not care for the look, simply do another coat of paint (allow the paint to dry completely between coats). But remember, with rustic flaws are acceptable! • You can place the board inside on your porch or yard in a pail filled with sand to allow it to stand easily. 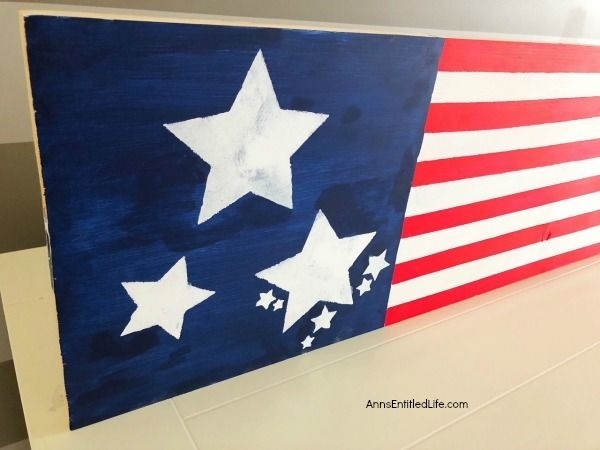 You can also make this flag craft on a square 2×4 painting each side. 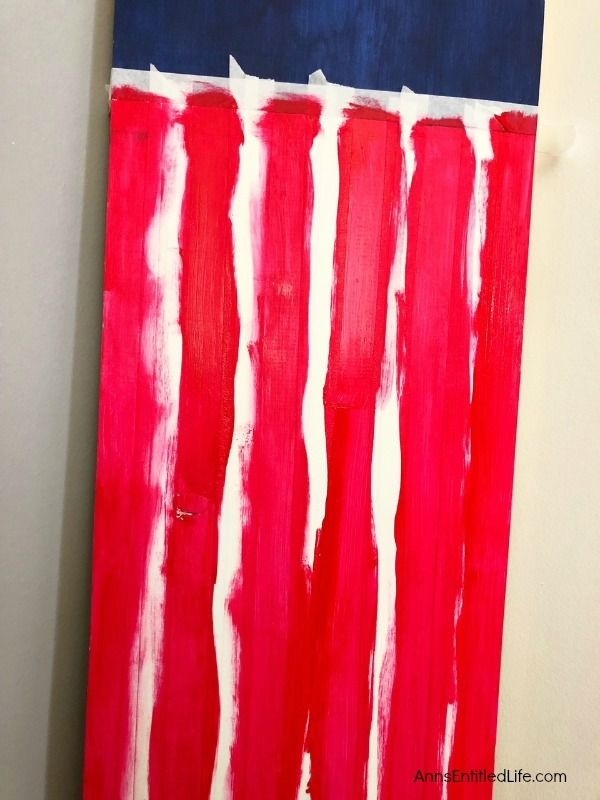 You can also simply prop this wooden American flag against a wall. • In a well-ventilated area, spray paint the board white. Allow to dry completely. • Spray paint a second coat of white paint on the board. Allow to dry completely. 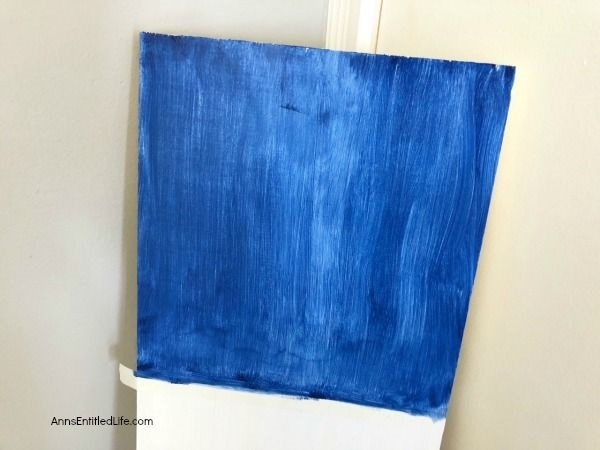 • Tape off the top quarter of your board, press the tape firmly down on edges especially, paint the top quarter navy and let dry. • Paint a second coat and let dry. • Tape off the bottom 3/4 of the board in 1” stripes and paint every other stripe red, let dry and paint a second coat. • Carefully peel off your painter’s tape. 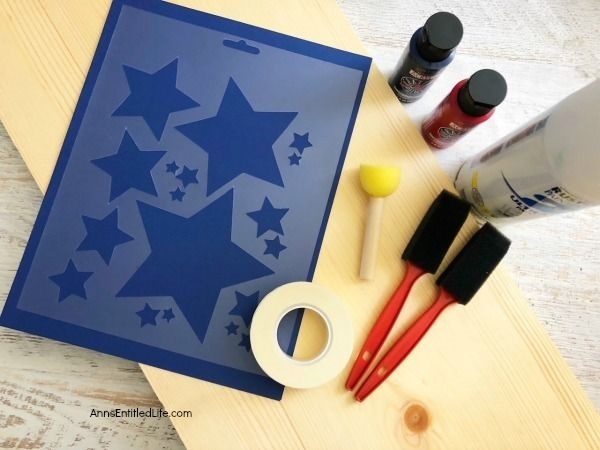 • Place your stencil on the top blue part of the board and use a foam sponge brush to dab white paint onto the stars while holding the stencil carefully in place, carefully pull off the stencil and let your stars dry. 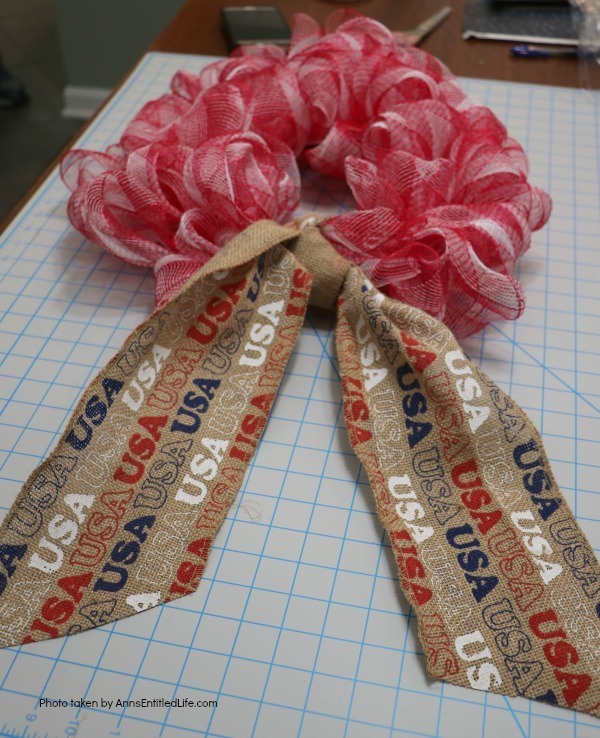 • Easy DIY Flag Wreath – Make your own no-sew Flag Wreath using these easy step by step instructions. 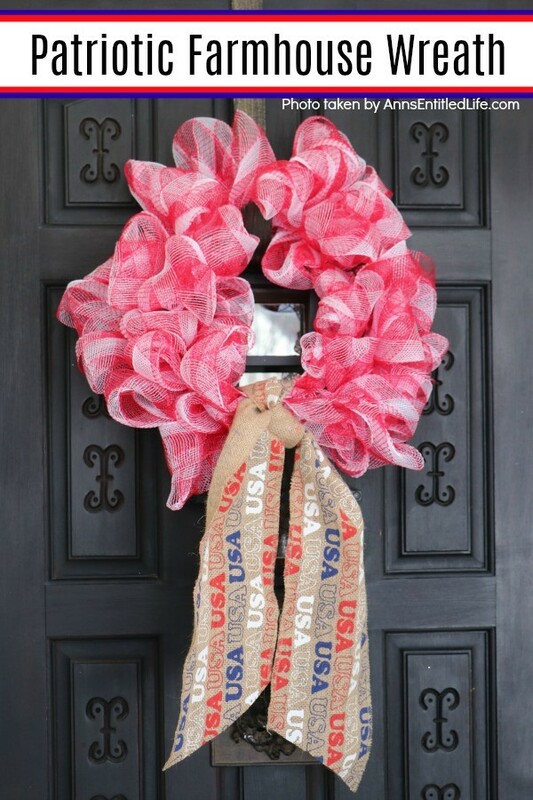 This simple, inexpensive to make flag wreath is awesome door-décor! 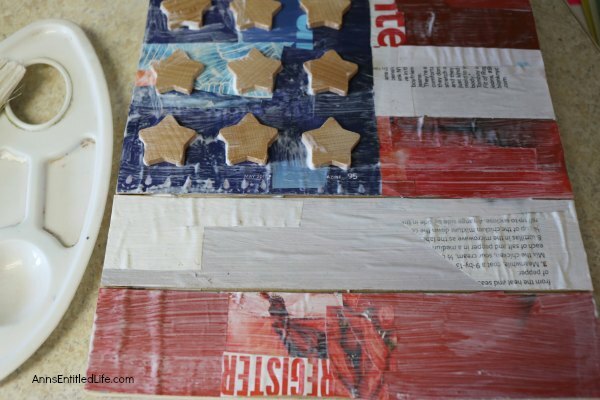 • DIY Decoupage American Flag Sign – It is a cute way to add Americana decor and get crafty all at once. 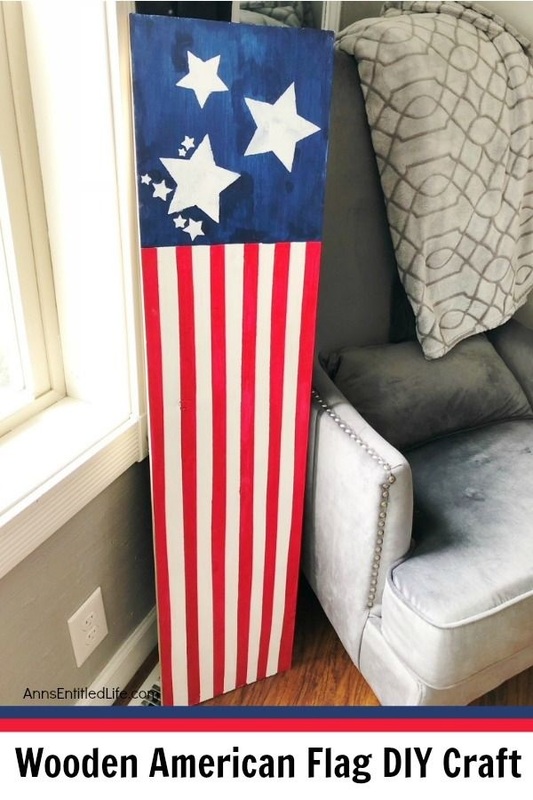 This DIY Decoupage American Flag Sign can be hung on your front door or inside your home or displayed on your patio for Independence Day – or anytime really since it is an “American Flag”. 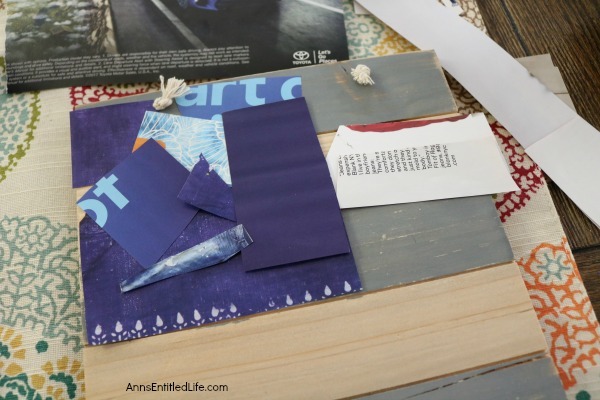 It is a cute way to add Americana decor and get crafty all at once. Wooden signs have become quite a big trend over the past few years, and many people make their own. You can find tons of them in stores to choose from but many people enjoy making their own – customization!! It is super simple to decoupage a wooden sign, and even easier to customize this with the exact shades or red, white and blue that you like. 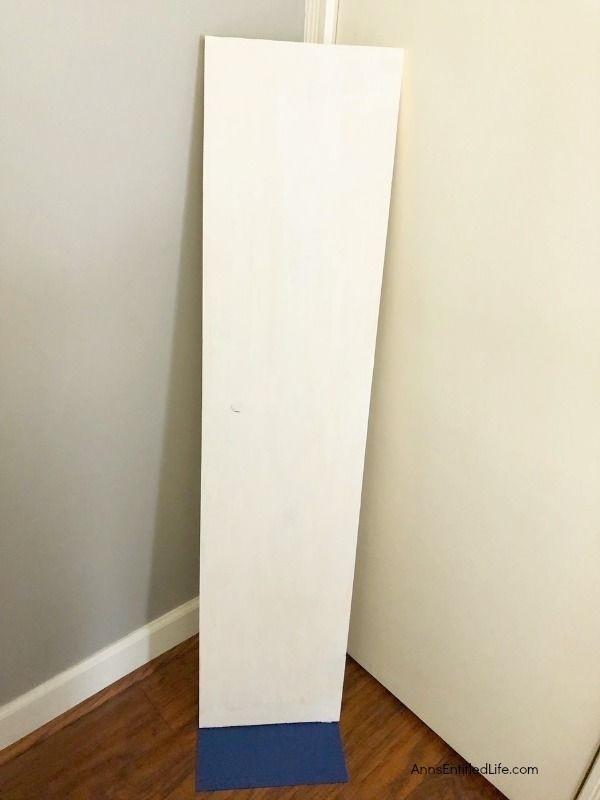 For the sign itself, you will need to either use some scrap wood you have around, and put your own hanger on the back, or buy a plain, pre-made wooden sign at your local craft store. 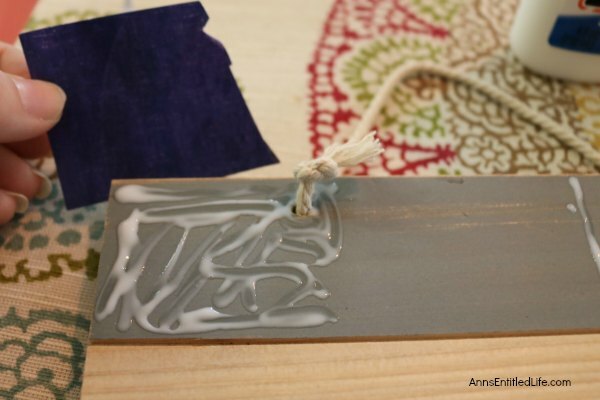 The one shown in this craft already had the rope hanger tied to it so it made it super easy. 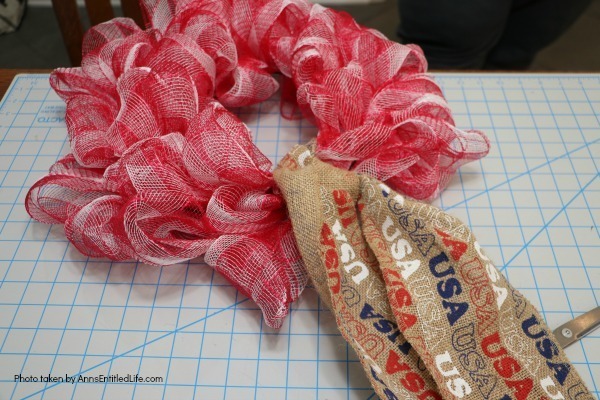 You could also use twine or a red, white and/or blue ribbon if you like. If you are looking for other patriotic flag crafts, check out this Easy DIY Flag Wreath (it is one of my favorite crafts on the blog! 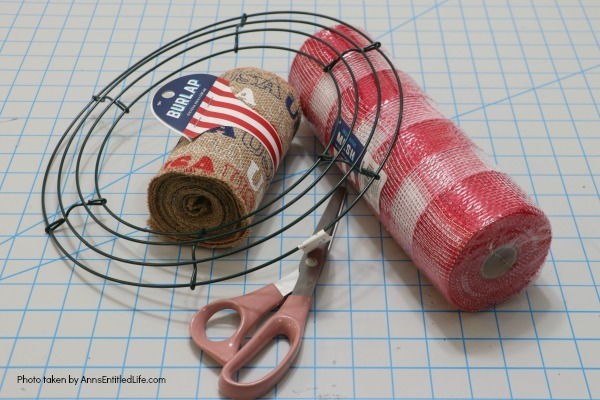 ), this Americana DIY Picture Frame (simple to make) or this easy Flag Wineglass DIY! Need a 4th of July breakfast idea? Try this homemade Flag Waffle Recipe. • Go through your magazines and hunt for American themed items you can add, as well as general red, white and blue pages. You will want a few different shades of each color. It helps to layer the pieces on and have a variety. As you are pulling pages out and cutting your shapes, put them into piles by color to make it easier for when it is time to glue. 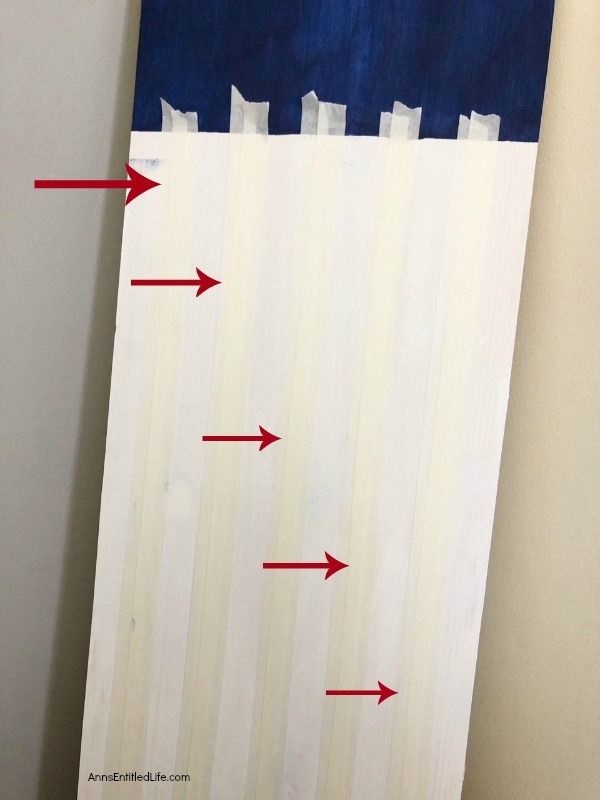 If your sign has separated pieces of wood the way the one in this tutorial did (it is not handmade), you have the stripes already laid out for you. However, if your wood is a solid you will need to decide before you glue how thick you want the stripes to be. Use a pencil and ruler to draw guidelines. • Wipe down the wood on the sign to dislodge any dust of debris. • Begin fitting your pieces together along the lines for the stripes. Make sure you plot these out before you begin gluing. Using Elmer’s glue begin gluing down the first section of red, then the white stripes. Alternate the stripe colors as you go. Keep yourself on track so as not to overlap a stripe into the next color’s area. It is easy to keep going and pass up the line if you are not careful. • Do the same for the left blue corner laying out the pieces of blue first so you can make adjustments, and then gluing down. Use your finger to smear the glue over the edges too, to help the pieces lay flat. The Elmer’s glue dries clear. • Glue stars to the sign. Allow to dry completely. 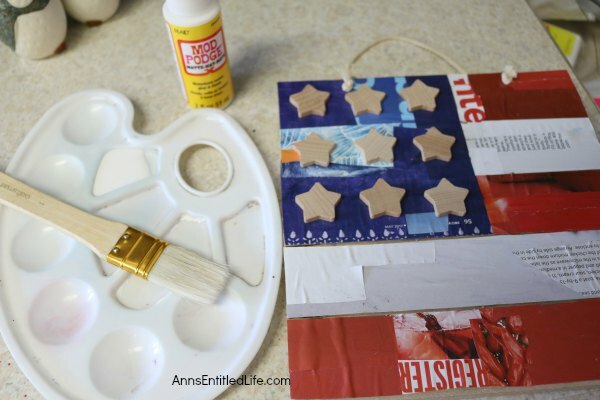 • Use your paintbrush to brush on a thick coat of mod podge over the entire sign – paper, stars – cover it all. No need to worry about brush strokes as that is part of the charm of the project. • Let the sign dry completely. 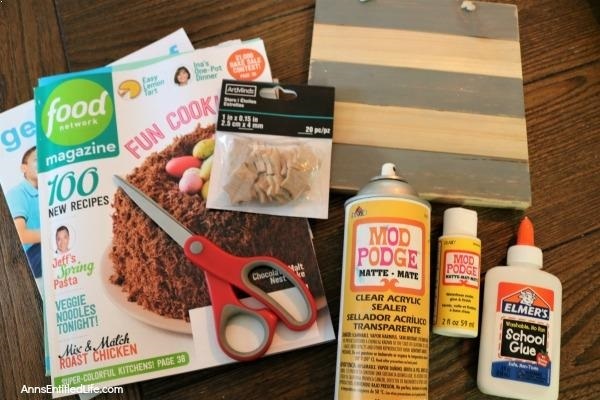 • Spray your finished project with a clear coat of Mod Podge Spray Sealer. It comes in several finishes from matte to high gloss, so you can choose the finish look you would like. • Display as you like! 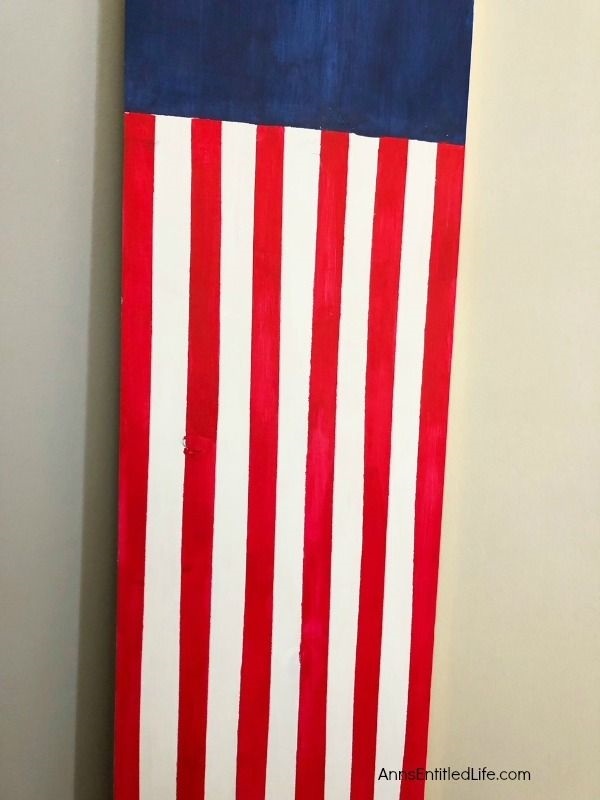 • To print the DIY Decoupage American Flag Sign instructions, click here.